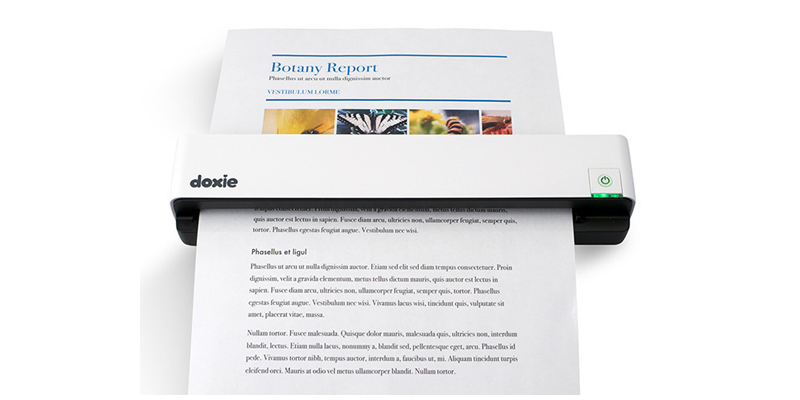 Doxie Go – This rechargeable A4 document scanner is compact and mobile, offering smart and simple scanning you can take anywhere. You can scan important documents with no computer required, simply insert your paper document and the Doxie Go can scan full colour A4 pages in as little as 8 seconds at up to 600 dpi resolution. This scanner works cordlessly using a built-in rechargeable battery and memory which can store up to 300 pages, or much more if you use an SD card or USB flash drive for additional storage capacity. The award-winning ABBYY OCR technology recognises the text in scanned documents and creates searchable PDF files and the included Doxie app syncs document scans and automatically creates multi-page PDF files. Pandigital Handheld Wand Scanner – this handheld scanner is great if you need to digitize documents on the road, with a rechargeable battery and memory card slot you can scan images anywhere up to 600dpi and save them as JPEG or PDF files. The Pandigital Handheld Wand Scanner is also really easy to use, just place the scanner on the page to be scanned, press the scan button, and a high resolution digital copy is instantly saved with just one touch. TaoTronics Handheld Mobile Portable Document scanner – this portable, handheld scanner is suitable for those travelling on business as it offers the ability to permanently archive all paper documents digitally at up to 1050 DPI resolution. Saved files can be converted to searchable PDF files using OCR technology and then stored directly to a SD memory card and the rechargeable 700mAh lithium battery means you can digitize documents anywhere.